HR Committee: If Coaching is So Great, Why Doesn’t It Work? Name: HR Committee: If Coaching is So Great, Why Doesn’t It Work? "Coaching" is a popular buzzword in management and HR circles. Everyone believes the promise that a coaching culture boosts performance, attracts top talent, and retains high performers. So why do so many organizations fail when it comes to building a coaching culture? 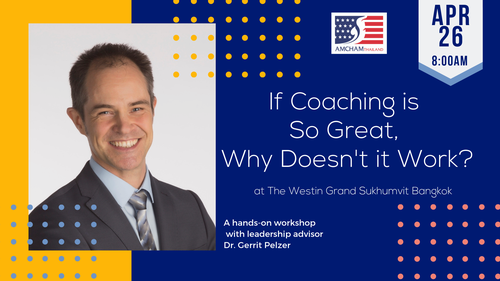 In this hands-on workshop, leadership advisor Dr. Gerrit Pelzer will help us learn from the three most common mistakes that companies make when trying to build a coaching culture: having no clear definition what a coaching culture is, having no clear objective, and underestimating how difficult it is to build such a culture. Since coaching is still in its infancy in Thailand, we will learn what coaching actually is, what it is not, and how to help it happen in our organizations.